With various service groups on campus, including The Farm at Stonehill, H.O.P.E., the Community Engagement Program, among others, Stonehill students serve their community in a variety of ways. Recently, some of these students were recognized for their commitment to service at the President’s Service & Justice Reception. Service program leaders on campus nominated students based on their exemplary commitment to service and social justice. 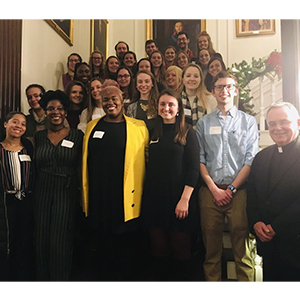 “These students were identified for the remarkable ways in which they work to build up the community and live the mission of the Congregation of Holy Cross,” said MaryAnne Davey, assistant director of campus ministry. Seniors were also presented with tribal stoles handmade by the families of the students of St. Andre School in Agartala, India. During the reception, several speakers including Davey, Ryan Thorley ’04, director of My Brother’s Keeper, and O’Shane Morgan ’16, Stonehill College admission counselor, spoke about living a Holy Cross life, the rewards of service and their decision to do a year of service after graduation.